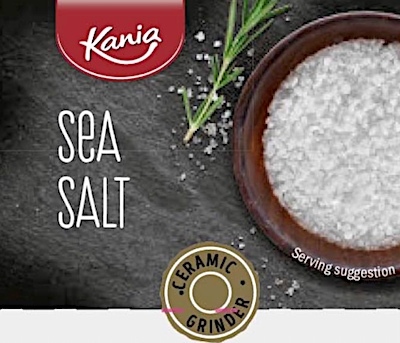 UK/London: Lidl UK, a Wimbledon, London, England establishment, recalls certain batch/lots of Kania branded Sea Salt Mills and Kania branded Black Pepper Corn Mills due to suspected glass fragment and consequential risk of choking, oral injury, internal ingestion and GI tract laceration damage, all serious health and safety hazards. ==> No barcodes, UPCs, EANs or other identification numbers were listed with this recall notification. Please consult the photograph above for details of the food’s packaging, design and retail presentation. One (1) additional image of the recalled Sea Salt Mills and Black Pepper Corn Mills can be found on the Web site above. According to the FSA, this recall was initiated because these products may contain Glass Fragments. If you believe you have purchased or have in your possession any of the recalled Salt or Pepper, please do not consume them directly nor use them as an ingredient in another dish or preparation. Instead, return the spices to the store where you purchased it for a full refund. ==> To see other recalls and notifications caused by contaminated, adulterated or mislabeled Salt or Pepper, please search for “salt” or “pepper” or more generically, “spices” using the Search Box at the top of this page. if you have any questions about this recall, please contact Lidl UK Customer Service on 0370-444-1234 during normal business hours, Monday to Friday. ==> To see other recalls and notifications for products manufactured, marketed and/or sold by Lidl UK, please search for “Lidl” using the Search Box at the top of this page. ==> To see other recalls and notifications for products manufactured, marketed and/or sold under the Kania brand name, please search for “Kania” using the Search Box at the top of this page.